Working on tall ships, you get all kinds of visitors, all the time, with the strangest of talents. This week a somewhat “famous” relief Captain and former crew-member of Windeward Bound, Dirk, came around to say hello and help out while our Captain is away. He’s recently back from the Bark Endeavor’s Australia circumnavigation, which took just over a year. And now he’s here to teach us about wire seizings. And we are excited. What makes a wire seizing exciting? Well, first of all, you get to use one of the most awesome and important tools known to traditional riggers throughout the world: a STICK with GROOVES in it! Yes, I know I’m sounding sarcastic right now, but I’m 100% serious. Check out my post on parceling and serving to understand how this simple tool so easily and perfectly guides and tensions the wraps of twine that we sailors use to protect steel cable. We used a serving mallet in that post, but here, Dirk is using a serving board to tension and wrap wire around two shrouds to hold them together. The other reason that learning about wire seizings is exciting is because it is just one more thing that we can all add to our tool kit of riggers’ and sailors’ skills. 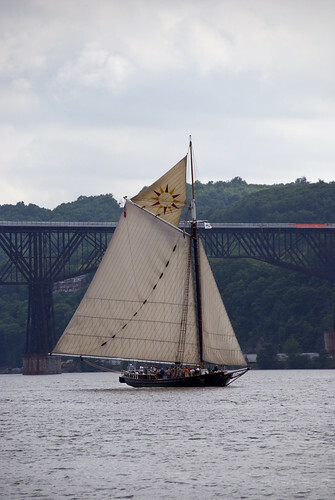 With visions of the sloop Clearwater dancing in my head these days, every new bit of knowledge I acquire is like a little stash of potential that may come in handy once I start my job. After dangling about the rigging over Dirk’s head for twenty or so minutes sticking my camera in his face, I wandered over to the foredeck and spied his bag of tricks. With permission, I opened it up to look through and I am again not joking when I say that I actually BLUSHED at how nice his tools were. Inside were a variety of fids, spikes, blocks, mallets, serving mallets, serving boards, a hand-made seam rubber, a bit of leather in the shape of Montana, and some beautiful tools whose exact purpose I can’t quite figure out. Thanks for the education and inspiration, Dirk!